We’ve all sent out a few texts using our phone; ones we wish we could have pulled out before they were delivered. If you’re an iPhone user, there are a couple of tricks you can use to stop a message you’ve just sent from actually being sent, thanks to a few seconds’ delay that iOS makes when sending out a text or a message. Alternatively, jailbreak users can make use of a nifty little tweak for this very purpose. As mentioned earlier, canceling a message being sent can be reasoned with more than just a bad idea. You may find it appropriate to cancel sending of a picture, or audio file if your network is congested during that time, as it will not only slowdown that content from being sent, but keep on hold further outgoing messages till the first one is sent through. 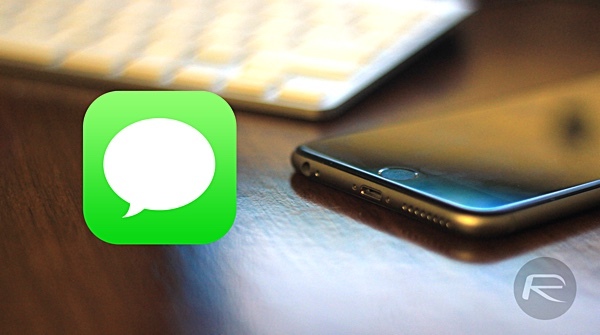 Step 1: To begin, launch the Messages app, and open any conversation. Step 2: Type in a message, be it an SMS or an iMessage, and hit the Send button. Notice how the top ribbon in the app reads “Sending…” as a blue (iMessage) or green (SMS) progress bar moves from left to right. We need to stop that progress bar from completing and you will have to be really fast, with only a few seconds to spare. Step 3: To stop that, we will be turning on Airplane mode on the iPhone. The fastest way to do that, as you may have already guessed, is to swipe up from the bottom of the screen to reveal Control Center and tap the Airplane mode icon. Step 4: Dismiss Control Center and wait for a few seconds till you see that outgoing message as cancelled with a red warning text reading “Not Delivered”. 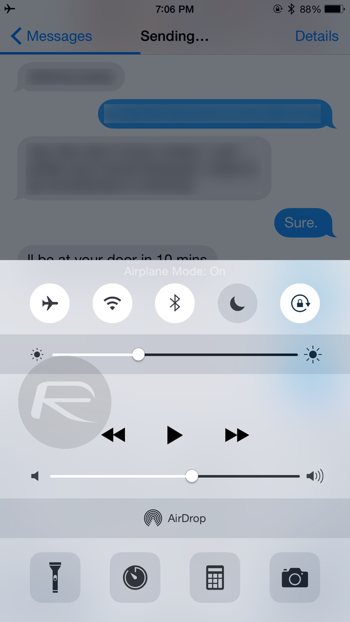 Now you can turn off the Airplane mode as well. Step 5: Tap and hold on the message you want to delete, then tap on ‘More’ and then the ‘trashcan’ icon on the bottom left as shown in the screenshots below. Putting the phone in Airplane mode shuts off the iPhone’s cellular reception, and if you were on WiFi, that too as well. So, not only will it stop the message being sent in the conversation you have opened, but any outgoing messages at that moment will be stopped. A new tweak called ‘DeLe’ adds that much needed delay to your outgoing messages before they’re actually sent out, giving the user a chance to retract that message. The tweak has a few more features to offer, but for the need at hand, we’ll look at canceling an outgoing message. 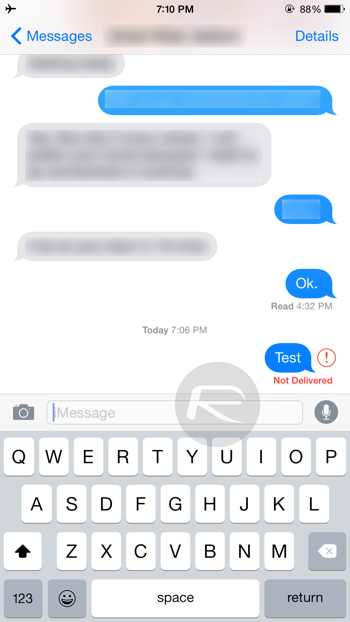 Step 1: Launch the Messages app and type in the message you want to send, be it an iMessage or SMS. Step 2: Once you start typing, you will notice a popup bar containing some editing tools, but ignore those for now, and hit the Send button. Step 3: Notice how the ribbon at the top of the bar shows a countdown timer till the message is sent out, showing you exactly how much time is left. 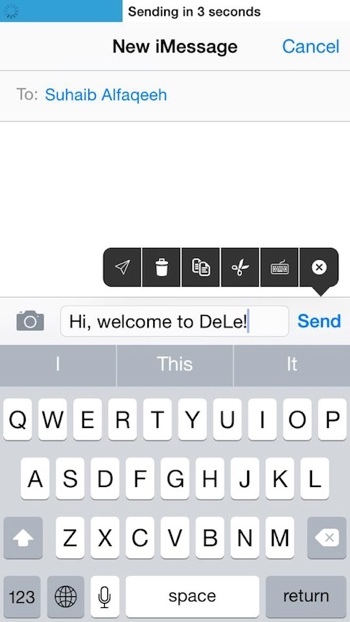 Now you can either erase the entire message by pressing and holding the Backspace button on the keyboard, or you can tap that trash button in the popup bar which is part of the DeLe tweak. Once there is no message in the Message/SMS field, nothing will be sent out, obviously. However, if you run out of time and are still in the process of erasing the message, whatever is left of it, will be sent out. DeLe costs $2.99, and can be found in the BigBoss repository in Cydia. Are you kidding me ? They are after the money. NO WAY! There is a way to do that for a priceless like this one minus DeLe. Or you can just use the free non-jailbreak method explained above. Or, you can actually think twice before you press the send button! Sometimes the text you’re sending just won’t go through clogging everything else on your phone. Easier to cancel it and send it as a text message. Sure, every developer should take the time and energy to develop tweaks for free and exclusively for you, until they are evicted and die of hunger.